Year after year I am asked for advice about how to cook the perfect turkey, so here is a post that I hope you find useful. When buying a turkey always choose organic or at the very least outdoor reared. Please please, please avoid frozen, battery farmed turkeys. There always seems to be a mad panic to buy turkeys so make sure you order yours in advance either from a good supermarket, farm shop or butcher. Remember, even if you order in advance there could be queues when picking up your turkey, alternatively your supplier may deliver – which will save you time and lots of patience! A size guide: Allow 500g of meat on the bone for each person, this will give you enough for a meal with some left over. Don’t forget: Make sure you have the right size roasting tray for your bird and that it will fit in your oven. Some people swear by brining their turkey, some don’t, but the truth is, is that turkey is a large bird that requires a lot of cooking – which can make the meat dry. Brining is totally optional but you might want to try it out. Combine all the ingredients into a large pot or plastic container squeezing in the oranges. Add the turkey and wrap with cling film leave in a cool place (i.e. fridge or even outside) overnight. Remove the turkey from the fridge or bring in from outside at least 30 minutes before cooking. If brining, wash and dry the bird, if not, make sure any giblets and packaging are out of the carcass. 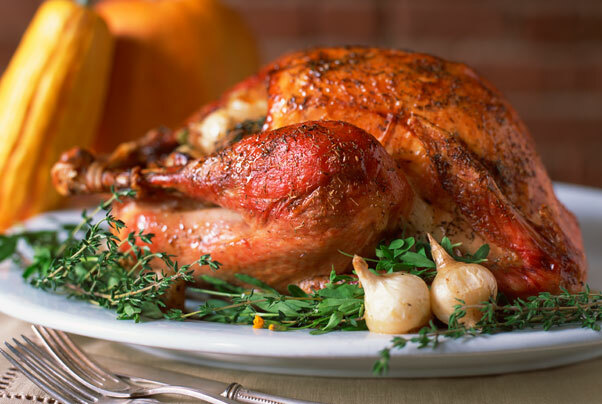 To get the best out of your turkey, stuff with citrus fruits, onions, garlic and herbs. These will steam from the inside. Also, combine 500g butter with thyme and prosciutto and carefully stuff under the skin on the breast, this will baste from the outside. Lastly, I like to crisscross streaky bacon on top of the bird – this is a cook’s treat and is lovely to nibble on when it’s delightfully crispy. Make a note of the weight of your turkey and the suggested cooking time if you bought your bird online and/or from a butcher. Supermarket turkeys should be clearly labelled to make this easy. Calculate your cooking time using the weight as a guide. Don’t forget: Your turkey will need to come out of the oven an hour before carving to rest and get firmer for carving. Turkeys are heavy, so just basting once half way through cooking should suffice. Roast the turkey for the required time, or until the juices run clear from the thickest part of the thigh if you pierce it with a knife or a skewer. Using a meat thermometer, probe at the thickest part and check that the internal temperature of the turkey is at least 70ºC. This entry was posted in Cooking skills. Bookmark the permalink. Is there such a thing as a fertility diet?